Raised beds at Newton Walled Gardens provide leaves for L'escargot bleu and blanc. The sun is shining. Which means that Fred Berkmiller's kitchen garden is blooming and the chefs at L'escargot bleu and blanc have lots of fantastic produce to work with. The 5pm Dining blog pulled on its wellies. 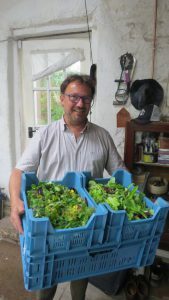 Since March 2017, Fred Berkmiller, the chef patron of Edinburgh's L'escargot bleu and blanc restaurants, has been cultivating herbs, salads and vegetables at the Newton Walled Garden to the south of the city. Around 1.3 acres in size, the garden is owned by Mary Fawdry. It has been in her family since 1947 although their connections with the land go back a century. As a child, Mary ran barefoot around the garden. Several decades later, she still works in the garden every day along with Fred. The chef would be the first to tell you how proud he is to have a role in the garden's story and how thankful he is to Mary for sharing it. Some fifteen or so months after Fred first started working on the garden, his plans are coming to fruition. This summer is the first time that they have been able to use a full range of the produce in the kitchens at the Bleu and Blanc restaurants. This blogger has known Fred for some time and has never seen him quite as enthusiastic as when he has his hands in the soil. We'll let Fred tell you the rest. 'Over the last few months, the garden has burst into life and it is a joy to watch it all buzzing with energy. Getting to this point has had its challenges. Every day has been a learning curve and I have always said that I am a chef, not a gardener. However, there are lots of similarities with cooking. Following your instincts plays a large part in both. After fifteen months, I feel as though I am getting into step with the garden and in synch with its seasons. We are working together. There is a flow and a natural rhythm to it. It has been hard work. Especially over winter. Hauling heavy bags of soil around in the freezing rain is nobody's idea of fun. The garden may have been dormant during the cold months but we have been busy. 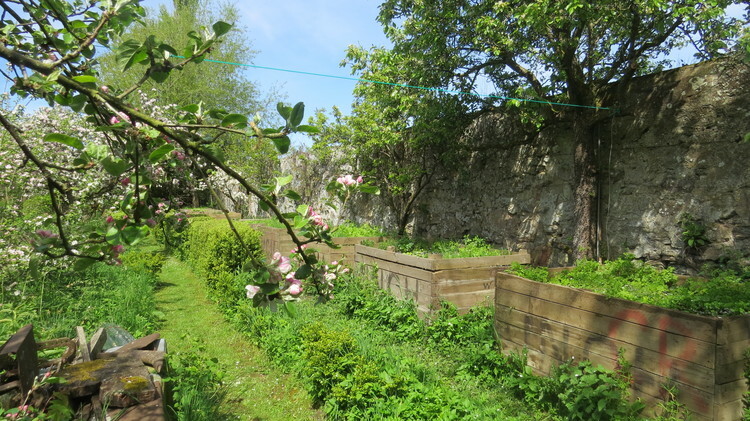 We have cleared more of the garden's wilder parts; installed more raised beds and a second compost heap plus we have put in several, three tonne potato crates. Possibly the most significant development is that we have erected a poly tunnel which will extend our growing season; hopefully to twelve months a year. The last few months have been all about preparing the ground; sowing seeds and planting them. When the first shoots come through, it feels as though it has been worth every early start and aching muscle. Provenance is important at L'escargot bleu and blanc. I grew up in a family where we looked forward to the first crops of each season and would anticipate the arrival of the season's first peas or potatoes. I remember my mother would drive 150 miles to get the season's first asparagus from Bourgueil. There is that same sense of excitement as the different crops come through in the garden. I have not counted everything but I estimate that we are growing around 60 different types of herbs and salad leaves plus a few dozen different vegetables. As a chef, it is hugely appealing to have a wide variety of ingredients to work with. We are growing some esoteric stuff like orach which is also known as mountain spinach. I'm looking forward to harvesting our Bonnotte de Noirmoutier potatoes. These are France's answer to Jersey Royals. 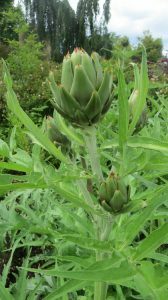 Artichokes are among the veg grown. Of course, we grow lots of more familiar ingredients such as peashoots, beans, beetroots, radishes, purslane, celery, chives... I could go on. We are at a point now where we are planning ahead. The sowing and planting is a rolling, ongoing process which will ensure a consistent flow of produce. Hopefully that flow will continue right through the year. The aim is to become self-sufficient in terms of herbs and salad leaves for L'escargot bleu and blanc. I don't like intensive farming methods whether that be for animals or plants. In our restaurants, we have always put a lot of care and attention into sourcing our meat, dairy and fish. Growing and harvesting in the Newton Walled Garden means we are confident that the same care and attention goes into sourcing our vegetables and herbs. Provenance matters but there is also the very important matter of taste. Intensively farmed vegetables from Spain and Holland have no taste. 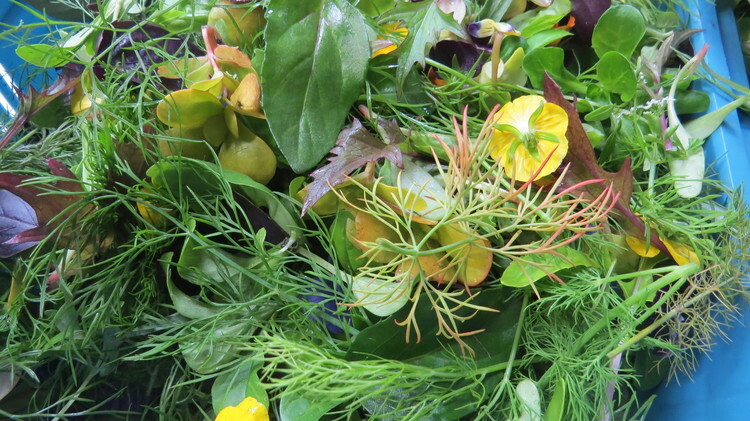 Growing our own herbs, leaves and vegetables has been a process of rediscovering their real flavours. Doing this is one way of getting excited about a carrot again. You can taste the fruits of Fred's labour at L'escargot bleu and blanc. Both offer a two course lunch for £12.90 or £14.90 pre-theatre. 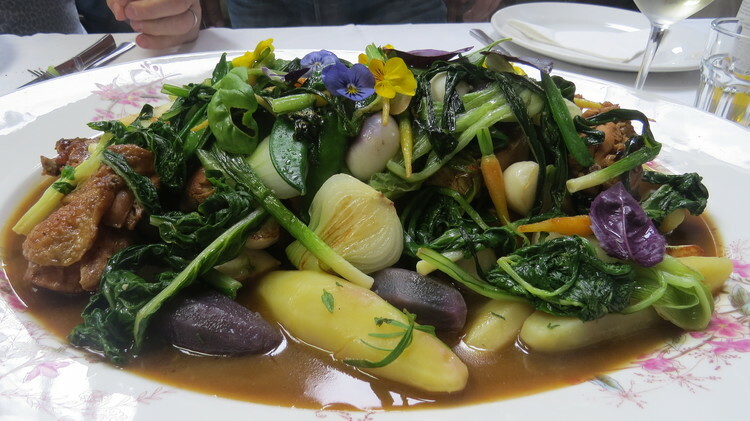 Fresh from the garden to the plate at Le'escargot bleu and blanc.